Please try to understand the real story of Megh Rishi. This story is taken from B.P. and Bhagavata Purana (Canto 6, Chapter 7-13). 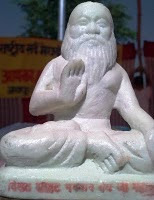 Brihaspati was the Guru of the Devas. He was very learned and was first among the Brahmanas. Everyone used to respect him. It so happened, that when he visited the court of Indra, the King of the Gods was busy watching his beautiful Apsaras sing and dance, saw his Guru arrive. However, in his arrogance, he did not rise from his throne, nor did he utter the customary words of welcome and worship. The sage felt insulted. He resolved that he will no longer grace the councils of the Devas, and went away to perform penance. Too late, Indra realized his mistake. H searched high and low for his perceptor, but could not find him. Without their Guru to guide them, the Devas could not survive for long. Besides, their traditional foes, the Asuras, will seek to exploit this opportunity to and cash in on their weakened state. Acting on the advice of Lord Brahma, the Devas installed Vishwarupa, the son of the God Tvashta as their new Guru. He was also a Brahmana renowned for his learning and yogic power. As time progressed, Vishwarupa started to notice that Indra and the Devas spent an inordinate amount of time in pursuit of pleasure. Besides, his mother was a Asura woman, and his loyalty was divided. Secretly, he started giving a portion of the sacrificial oblations (Havis) to the Asuras. As a result, their strength increased. When Indra came to know of this treachery, he became very angry. Without pausing to think the consequences of his actions, he struck off the three heads of Vishwarupa. The first head, that was used for drinking Soma, became a francolin partridge, the second head, used for drinking wine turned into a sparrow and the third, used for eating, turned into a partridge. the head of his teacher with his sword. Since he had killed a Brahmana, that too his Guru, he became guilty of the sin of Brahma-Hatya. However, he escaped his punishment by distributing the sin among the land, water, and women. (Other accounts say that his lusture diminished and he had to regain it by doing penance, during which time he was exiled from heaven.) In return for ridding Indra of the sin, earth got water to fill its empty holes, trees got re-growth of cut branches, waters became purifying, and women obtained undiminished sexual desire. As a result of their share of the sin, earth has wastelands, trees have sap, waters have froth, and women have menstruation. Now, Tvashta wanted revenge for the murder of his son. He began arrangements for a sacrifice that would give him a son who could slay Indra. The sacrifice was duly performed, but there was a small problem. When it was time for the final incantations, Tvashta ought to have said, "May this son of mine be the slayer of Indra", but he stressed the wrong syllables in the Mantra, and the meaning changed to "May Indra be the slayer of this son of mine." From the sacrificial fire, there rose a terrible Asura. He was named Vritra, 'the encloser'. He immediately grew immensely big and was as large as the largest mountain. His hair was like molten copper, he had a mustache and beard of the same color and had eyes blazing like the midday sun. He was armed with a magical trident. He derived his immense strength from the incantations chanted at the sacrifice. His father then ordered him to go and slay Indra. Obedient to the command, the demon began to seek the slayer of his elder brother. Some time before this, the Asuras had been thoroughly defeated by the Devas in battle. Peace reigned for a while. The Devas needed a place to store their weapons safely, for they feared treachery. They then remembered that the Asuras dared not approach the hermitage of the sage Dadhichi, such was the yogic power of the hermit. They entrusted all their weapons to his safekeeping. When Dadhichi's wife Lopamudra came to know about this, she was not pleased. She said to her husband, "An ascetic should not take sides in a war. Now the Asuras will think that you are their enemy and seek to harm you. Besides, the Gods have not mentioned how long you are to take care of their weapons. If something were to happen to them in your custody, will they not blame you. We have renounced all worldly possessions and attachments, you were wrong to have taken this responsibility." Dadhichi saw the force of her arguments. He said, "What you say certainly makes sense. However, I have given my word. It is important to stand by ones promise. Besides, the Asuras were always the enemies of us sages, so the question of neutrality does not arise. What is fated will happen, and no one prevent it." Years passed, and Dadhichi was alarmed to note that the lusture of the divine weapons was beginning to diminish. Their power was slowly dissolving in air. The sage then used his yogic power to dissolve all the weapons in water and then he drank it all up. Their power was then lodged in his bones. Now, with Vritra threatening at their doorsteps, the Devas wanted their weapons back. Dadhichi said, "I have bad news for you. Your weapons are no longer there. Their power now resides in my bones. I shall give up my life. You can then have new weapons made from my bones." The Gods naturally balked at the thought of the Rishi's death. However, no other choice was available, for they needed the weapons to battle Vritra. Dadhichi gave up his life. 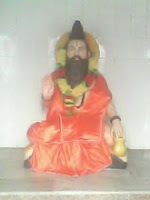 Vishwakarma made Indra the weapon Vajra from the back bone of the hermit. This weapon was the most powerful weapon of all. The armies of the Devas and Asuras met in the battlefield. From the furious onslaught of the Asura army, the Devas were initially driven back, but they redoubled their efforts and slowly gained the upper hand. Seeing his forces retreating, Vritra was extremely angry. He charged ahead and stopped the advance of the Devas single-handedly. He let out a mighty roar, which caused many of the Devas to faint. Under his purposeful tread, the heavens began to shake. He picked up his immense mace and struck Iyravata with it. Indra revived his mount with a touch of Amrit. At this point, angry words were exchanged between Vritra and Indra. The Asura taunted Indra for having slain his brother, a defenseless Brahmana. Angered, Indra struck off one hand of Vritra with his sword. In retaliation, the Asura made his mouth immensely huge and swallowed Indra whole. Though he was swallowed by the Asura, Indra did not die, for he was protected by the grace of Vishnu. He judged it to be time to use his Vajra. He used the great weapon and sliced open the abdomen of the demon, and emerged victorious. However, having slain the creature emerged from a holy sacrifice, he was once again weighed down with sin. Unlike before, he could not get rid of it easily. He retired to the banks of Manasarovar and performed a penance for thousand years to expiate his sins and to regain his lusture.